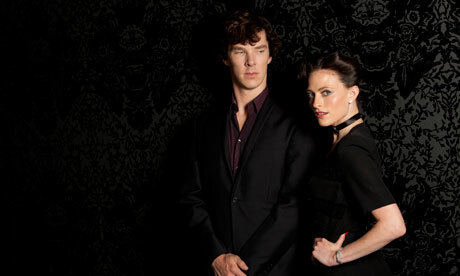 Lara Pulver to be female Doctor Who? The Daily Express isn’t a paper I read very much, but it has a strong entertainment team who have broken a lot of stories, and today’s latest via their mole at the BBC… the next Doctor Who will be a woman, the actress Lara Pulver who played a very naughty Irene Adler in the recent Sherlock TV series. How true is this? Well, SFcrowsnest reported rumours when David Tennant was on the way out that they were considering a female Doctor then. Has the time come for a lady driver at the wheels of the TARDIS? Yes it has. Give Lara the role! I’m for it! let’s shake things up! Well, I would find it a bit weird but not for any sexist reasons – it’s just inconsistent with the rest of the series. Regeneration hasn’t really been thoroughly explained in the series but as far we’ve seen so far there are male time lords and female time lords. We have consistently seen males regenerate as males and females as females so to have the Doctor regenerate into a female would be a bit random. I’m no biologist (or alien biologist) but I always assumed time lords had some basic DNA-type encoding in their physiology which ensured they were always a recombination of the same basic genes (as well as retaining their memories of course) which ensured that after regeneration they were still essentially the same person – maybe gender is included as part of that. Anyway, that’s enough fanw**k from me.
? I personally can’t stand this actress. Maybe she’s better than she was is Sherlock’s Scandal in Bohemia, but I’ve never seen her do that well in anything I’ve seen her in. I suppose if it works it works, but I don’t understand why this actress is appealing to anyone. If she becomes the doctor, I stop watching the show. There are just so many others that would be better female doctors.